Please note that all pictures shown here are currently in development. The final may lock total different compared with this work in progess versions. This is a picture of the ValiantCreator. 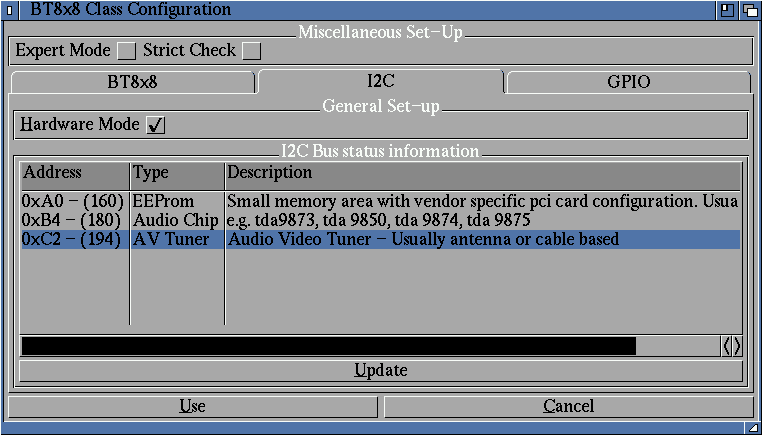 It allows to add and link classes, to you can build a TV driver for your TV Card. 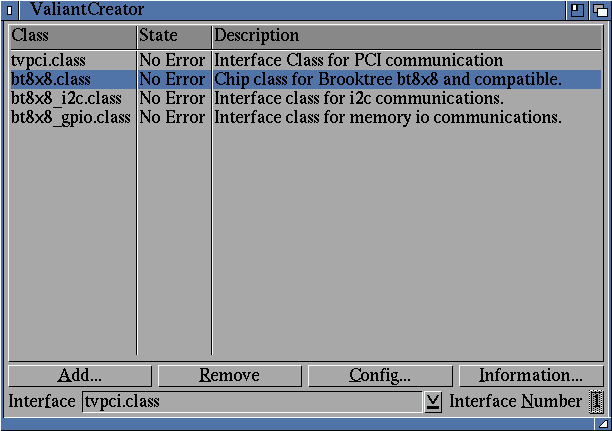 By pressing the configuration button the class internal user interface will open. This allows a flexible way of configuration and setup. The user simply notes the chips on his tv card and adds them here. 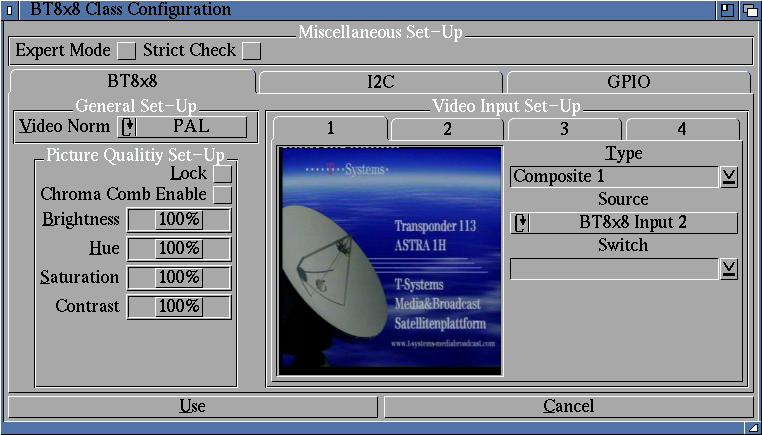 This is the interface provided by the pci class. It allows to force a pci system, or let the class handle it on it's own. It's also possible to select the tv card you want to use with the current driver. The bt8x8 is the heart of many tv cards. Just for protocol! This is not an application for watching TV! It's just the configuration window. Modern tv card use a Philips saa713x chip, which is much better than the bt8x8 type chips. Yes, I know the image looks like the bt8x8 class. The reason is, that I reused the entire driver code and just replaced the bt8x8 specific code by a saa713x specific version. You have to trust me here. From the users sight this is much easier and more logic than having it mixed up, just to make it look different. Again! This is not an application for watching TV! It's just the configuration window. As you may noticed in the ValiantCreator picture this class is providing 2 additional interfaces for chip driver linking. 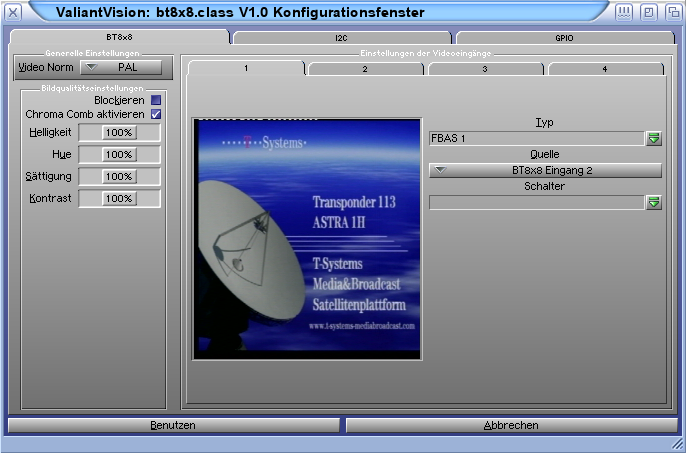 This picture shows the i2c controller GUI. The list is just to show the user it's working and to give him a clue what driver may be useful to connect. Since the i2c chips are identified by address only, some definitions are not specific, as you can see at the audio chip. Since the chip specific driver class will know which address is possible that's not a problem. This picture shows ValiantVision on Amithlon. 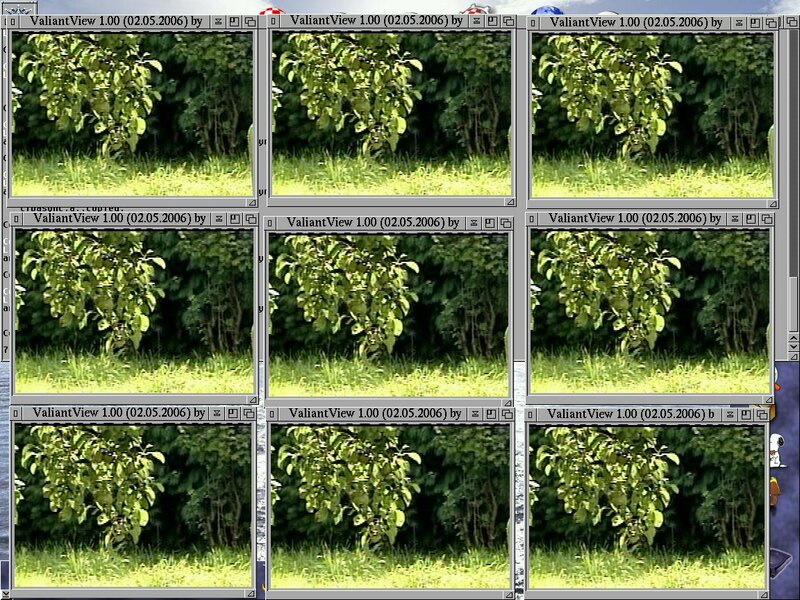 The application you see it actually a simple 4KB tool named ValiantView. The real cool stuff is that the picture itself is a MUI class named ValiantView.mcc which can be used by any program. There is no limit to the number of pictures on screen. It's just a question of CPU and GFX power and of course a question of memory. Remember: These windows show the running television! 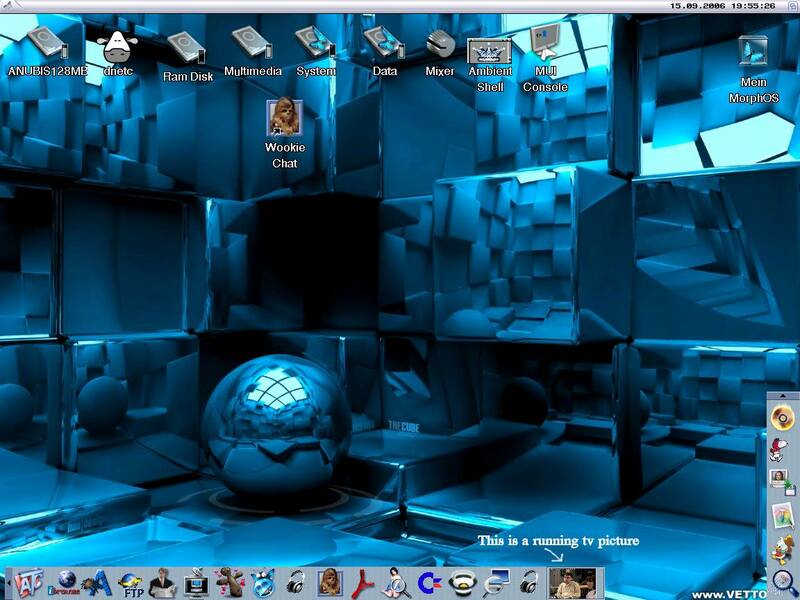 This picture shows ValiantVision on MorphOS. It's still 68K for now as you can see in window title. I marked the important part of the picture.